CtrlAltStudio Viewer 1.2.6.43402 is an early test version that has been replaced with the updated CtrlAltStudio Viewer 1.2.6.43412 to address some issues, support the X-Box One controller, and provide further graphics experimentation options for the Oculus Rift. These notes were to prepare for testing and usage of CtrlAltStudio 1.2.6 as updated for the Rift CV1 and Oculus Runtime 1.5.0/1.6.0. CtrlAltStudio is a version of the virtual worlds viewer for Second Life and OpenSim created by David Rowe. It has been updated to CtrlAltStudio 1.2.6.43402 to run with the Oculus Rift CV1 (as well as the previously supported DK2) under Oculus Runtime 1.5.0 (and subsequently tested with 1.6.0). Note that this release is based on Firestorm 4.6.9 with hotfix 42974 which were released in December 2014. There have been many improvements in Firestorm and other viewers since then that are not included in CtrlAltStudio Viewer. Unless you really need Oculus Rift or stereoscopic 3D support you should seriously consider using another viewer instead. Linden Lab’s cashier update of 15th Jun 2016 (TLS 1.2 enforcement) is not supported when using the built-in web browser (e.g. trying to purchase from the Marketplace). However, user/user transactions, transactions via in-world vendors and L$ purchases via the button in the top right corner of the viewer will still work. CtrlAltStudio Blog Post & Discussion: Oculus CV1 Support? Stereoscopic 3D, variable walk & fly speed, Xbox 360 controller support, and Kinect for Windows support work the same as in the previous versions of CtrlAltStudio. See the CtrlAltStudio Viewer page for usage instructions. If you have not already done this before, Oculus Rift output must be enabled in CtrlAltStudio: Preferences > Graphics > Display Output > select the Oculus Rift radio button. A restart of the viewer is required. If you wish to use an X-Box controller and have not already done this before, enable this in Preferences > Move & View > Movement > Joystick Configuration. You might find the default settings for the X-Box controller are a bit sensitive. If so look at the suggestions near the end of this Blog Post. Then start the CtrlAltStudio viewer. Oculus Home should launch automatically if its not already running. You can read and dismiss the health warning at any time. Oculus Home might then show it is waiting for the CtrlAltStudio application to start, or might indicate it is not yet started and is delayed. This will not go away until you first enter the 3D mode in the viewer, as indicated below. The “Toggle 3D” button (or Ctrl+Alt+3) then switches into Riftlook view, automatically displaying the output on the Rift. 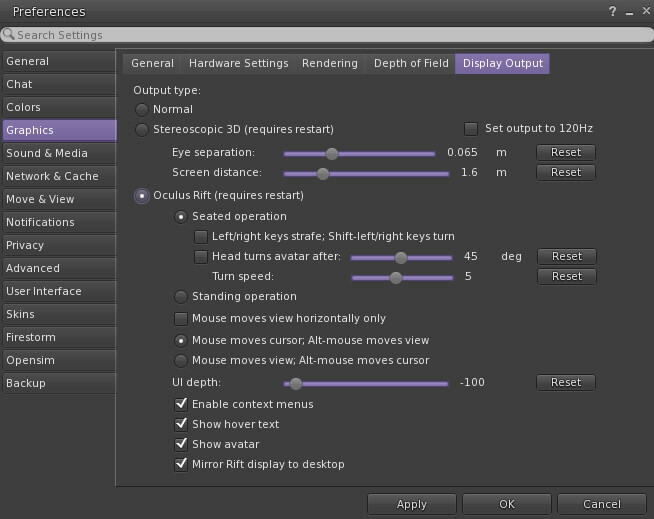 To exit Riftlook and move the viewer window back to your main display: use the “Toggle 3D” button (or Ctrl-Alt-3). Some users report that the 2D monitor set to full screen may be helpful as the mouse cursor does seem to be able to go off screen if you have multiple monitors. You can use keyboard shortcuts to show and hide dialog boxes such as the Conversations/Text Chat window (Ctrl-T) and Inventory (Ctrl-I), e.g., if you want to select a landmark to teleport to. The available keyboard shortcuts are shown beside menu items. If you are sitting on an object and cannot conveniently see or reach the “Stand” button in the User Interface, you can use the keyboard shortcut “Ctrl+Alt+S” to stand up. To display avatar chat in a possibly more useful format in the Rift — Preferences > Chat > General > Show chat in bubbles above avatars. With floating text you may want to adjust the distance the floating text fades at so that distant text is not so annoying in Riftlook: Preferences > Graphics > Rendering > Floating text fades to stop displaying at distance. You can use voice chat and toggle your microphone on/off using the middle mouse button (default, or such other key you have configures in Preferences > Sound & Media > Voice Settings). You can hide and show User Interface menus and elements using Ctrl+Alt+F1 (Advanced > Rendering Types > UI, as is usual in the Firestorm viewer). You can hide and show the HUD attachments using Alt+Shift+H (as is usual in the Firestorm viewer). 1st Person View — If you have the letter keys set to affect movement (default, rather than start local chat) in Preferences > General (or in Preferences > Move & View > Movement) then the “M” key will toggle between “Mouselook” 1st person view and 3rd person view. 3rd person view — depending on your “Mouse moves cursor / view” setting, you can also switch between 1st person view and 3rd person view by scrolling in or out with your mousewheel or press Alt and scroll out with your mousewheel. You can then orbit around points etc. with your mouse and Ctrl, Alt, and Shift keys as usual. Press Esc to get back into 1st person view. The CtrlAltViewer uses a version of the Firestorm viewer which uses a “GPU table” to identify the initial settings to use for graphics. This mechanism is replaced by a more dynamic scheme in more recent viewers. But if your graphics card is new it might not have an entry in the GPU table. Examples of recent graphics cares not included in the original GPU table include: Nvidia GTX 1060, 1070 and 1080 and Radeon RX 480. this can cause the image to appear black when in the 3D Riftlook view. You can manually enter one yourself for CtrlAltStudio if necessary at C:\Program Files\CtrlAltStudio-Viewer-Alpha\gpu_table.txt. Early reports indicate that the UI overlays work on the DK2 but are out of focus or have the eyes reversed on the CV1. It can appear okay of you only look through one eye. For the UI, you can edit the following file to increase the min/max values of the “UI Depth” slider in the Viewer > Preferences > Display Output > Oculus Rift settings: C:\Program Files (x86)\CtrlAltStudio-Viewer-Alpha\skins\default\xui\en\panel_preferences_graphics1.xml. Near the end of the file there’s a control “RiftUIDepth”: and you can adjust the “min_val” and “max_val” values. After you change the values in the .xml file you have to restart CtrlAltStudio viewer, then go to Viewer > Preferences > Graphics > Display Output > Oculus Rift and then adjust the UI Depth slider. User feedback testing CtrlAltStudio 1.2.6.43402 suggests changing the min_val to: -120 (from 0) and that the Oculus CV1 starts to focus at -80 and below. From there you can adjust it to your taste. A RiftUIDepth of -100 appears to be a reasonable starting position to try for the CV1 (+100 is the default initial value for the DK2). The cursor being visible in only the left eye is intentional behaviour. David Rowe reports that it is a “hack” that lets the cursor hover over UI elements and in-world objects correctly without needing complex code to sort out what depth to place the cursor at. Xbox 360 controllers (wired or wireless) work fine. But Xbox One controller (wired or wireless) moves you vertically up without touching any control. The X-Box One controller seems to have an issue that causes the Z Axis and Z Rotation to be at a 0 value at all times until the button is pushed rather than 50%. This causes the in game Y axis to be always activated. 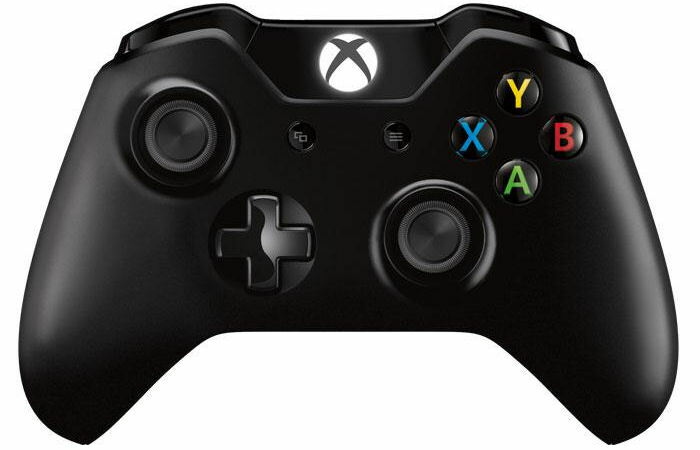 This causes the Xbox One controller to have different mappings of its physical controls to driver outputs. 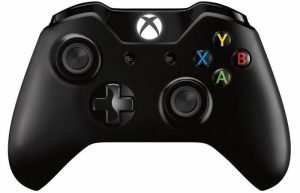 In Windows’ Control Panel > Devices and Printers > Xbox Controller > Game Controller Settings > Properties the 360 has a single “Z Axis” which the left and right triggers both control, whereas the One has separate “Z Axis” and “Z Rotation” for the two triggers. This issue is addressed with a new settings in the revised CtrlAltStudio 1.2.6.43412 (18-Jul-2016). Download the latest Oculus SDK from https://developer.oculus.com/ and install. Close any running instance of Oculus Home and/or Rift games you may be running. Open Oculus Home again first, before anything else. Now open the Oculus Debug Tool before launching any games. Set only the ‘Pixels Per Display Pixel Override’ option to a value of your choosing between 1.0 and 2.0 (no need to search for an ‘apply’ button – once the value is changed it should be active). Launch your game of choice from within Oculus Home and enjoy the sharper image and revealed in-game detail. Close the Oculus Debug Tool (this should fix any stuttering, according to some user feedback). The setting is not persistent, so for every subsequent game you want to play, open the debug tool first and set the value once again. This entry was posted in Oculus, OpenSim, Second Life, Virtual World, VR and tagged 3D, CtrlAltStudio, Oculus, OpenSim, Rift, Second Life, VR. Bookmark the permalink.